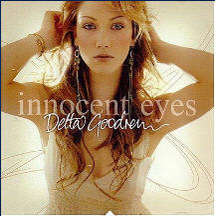 This is the cover of an album titled Innocent Eyes by Delta Goodrem, a good singer. The image comes from a screen shot of the cover as it appears on Pandora, which is pretty much all I ever listen to when I'm at my home computer. If you like listening to free music from a wide variety of music types at pretty high kbps, you should check out Pandora. You can set up "radio stations" and customize them to your liking by choosing which tracks and which artists you like and which you don't. Right now mine are Enya Radio, Females, Harmonica, Plamplam, SouthCountry, Susan Tedeschi Radio, and Walter Trout + Rascals. This idea of making money is interesting. Pandora's IPO closed on June 15, 2011, at $17.42 per share, but as of today, January 12, 2012, it is at $11.92, which means it has lost 31.6% in seven months. Just as with a real radio, you pick the station you want to listen to and someone else picks the tracks, except that the picker at Pandora is a computer program that analyzes music and decides based on your choices what else you might like. I've discoverd a lot of artists I really like, such as Susan Tedeschi and Walter Trout, by going with Pandora's suggestions. The way you tell the program whether you like or don't like a particular track is by hovering over the album art and then you get an Up thumb or a Down thumb. When you get to this album cover on Pandora you get 8th-grade humor. Try hovering now.